The U.S. Embassy in Mexico City on May 23 distributed this press release from the Defense Department about Secretary Mattis’ meeting with the North American Defense Ministerial. 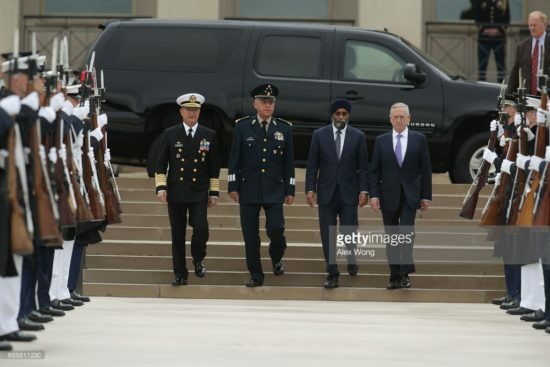 On May 22, 2017, Defense Secretary Jim Mattis hosted the third North American Defense Ministerial (NADM) meeting with Canadian Minster of National Defence Harjit Sajjan, Mexican Secretary of National Defense Gen. Salvador Cienfuegos, and Mexican Secretary of the Navy Adm. Vidal Soberón. The NADM is the defense component of North American regional cooperation efforts. Secretary Mattis also hosted bilateral meetings with Minister Sajjan and Secretary of National Defense Gen. Cienfuegos and Secretary of the Navy Adm. Soberón. The secretaries and minister concurred on the importance of the North American community and continued cooperation and friendship as an example to the international community, to address the common and borderless challenges facing our region, and to advance the security of our people. The secretaries and minister recognized that North America, as a community, has global responsibilities and that complex challenges are best addressed by cooperative responses. The NADM provides a potential framework for cooperation and coordination among North America’s defense institutions to build a common understanding of threats and approaches to address these threats and to identify and implement initiatives to promote trilateral defense cooperation. The secretaries and minister decided to strengthen U.S., Canadian, and Mexican defense cooperation, advance the capability of the North American community to address mutually identified hemispheric defense challenges cooperatively, expand trilateral support and cooperation for multilateral regional defense institutions, and exchange lessons learned and best practices for peacekeeping activities.